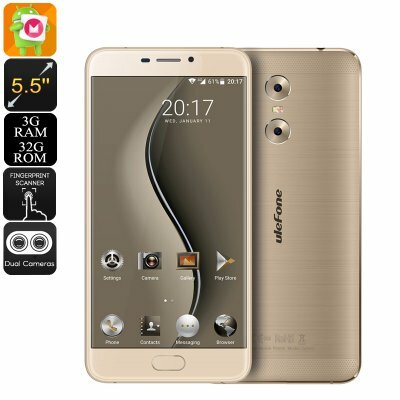 Successfully Added HK Warehouse Ulefone Gemini Android Phone - 13MP Dual Camera, 1080p Display, Android 6.0, Quad-Core CPU, 3GB RAM (Gold) to your Shopping Cart. With its Quad-Core CPU that has been clocked at 1.5GHz, 3GB of RAM, and ARM Mali T720MP GPU - the Ulefone Gemini is an affordable Android phone that truly brings along some great specs. On its beautiful 1080p display, this latest Android phone lets you enjoy all your favorite media in stunning 1080p resolution. Additionally, it runs on an Android 6.0 operating system thanks to which you’ll be able to truly take the most out of this smartphone along with all the latest software features the industry has to offer. Packing Dual-IMEI numbers and supporting 4G connectivity, this Chinese smartphone is perfect for business and entertainment alike. No matter the type of smartphone user you are, the Ulefone Gemini is sure to meet your demands. Equipped with an epic Sony 3250mAh Lithium-ion Polymer battery, it provides you with an unbelievable 12 hour of continuous usage time. No longer will there be the need to fear about battery life as, with this powerful phone at your side, you’ll be able to get through multiple of the most demanding smartphone days without needing to recharge. With this stunning battery, you’ll have enough time to enjoy your favorite movies, series, games, and more. Thanks to its 256GB external memory support, you can be sure that this phone always holds enough space to store all your files and media alike. Packing a mind blowing 13MP dual rear camera, this phone opens up the doors for professional-grade smartphone photography and makes it available at an affordable price. Shoot crisp 13MP pictures and capture detailed 1080p video; nothing is too much for this beautiful camera phone. Featuring great focus and capturing amazing depth, detail, and color – this Android phone truly provides you with all the freedom you need to meet all your artistic photography demands. Both rear cameras have furthermore been equipped with the 5-element lens, enabling you to capture vibrant images at any time of the day. The Ulefone Gemini is not just a regular Dual-SIM smartphone, it also supports two IMEI numbers. From now on you’ll be able to slide in two SIM cards and be reachable on two phone numbers while using merely one device – making it the perfect Android phone for separating work and private life. Additionally, its 4G connectivity provides you with the fastest mobile data speeds out there – keeping you connected with friends, family, and colleagues throughout the day. No matter where you’ll be headed next, with this Android mobile phone at your side you’ll always stay connected. The Ulefone Gemini comes with a 12 months warranty, brought to you by the leader in electronic devices as well as wholesale electronic gadgets..